The Centre for Advanced Study (CAS) invites researchers to pursue excellent, fundamental, curiosity-driven research during a year in Oslo. CAS is currently not accepting applications. The application portal for the 2022/23 academic year will open in fall 2019. CAS' primary objective is to further excellent research by providing its fellows with uninterrupted time for research. Project leaders can invite researchers from around the world at any stage of their careers to participate in the project -- whether for an entire year or for a few months. 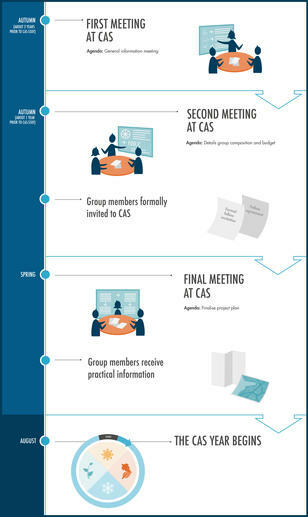 The CAS Board of Directors will in February 2019 determine which of the submitted proposals will proceed to the next round. At that point, applicants will be asked to draw up a full project outline, which will be reviewed by international experts. The full project outline must also include a list of Norwegian and international scholars interested in participating in the project. It is essential that the group consists of researchers with international publications. Some of the researchers can be Ph.D. candidates and/or postdoctoral fellows. Scientific merit is the only criterion used in CAS' evaluation process. The final selection of the three projects will be announced in September 2019. CAS will assist project leaders during the two-year planning phase leading up to the year at the Centre. If you have any questions about the application process, please do not hesitate to contact us at cas@cas.oslo.no.